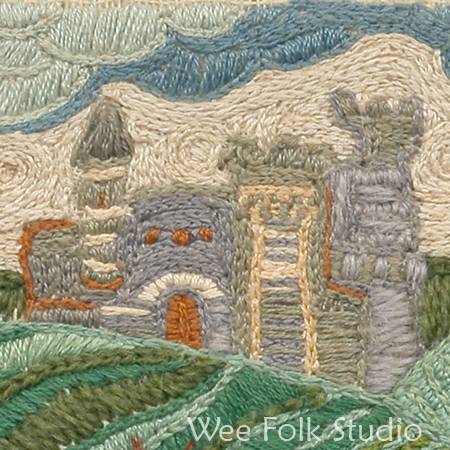 The first image is a detail from an embroidered illustration I made for a class in 1974. The assignment was to make an album cover for a made-up band. Mine pictured a kind of folk/rock/ renaissance musical group with a landscape and castle in the background. I think this was the first totally stitched scene I made. I found a stitching how-to book at the library and followed the directions. Before this all of my embroidery was embellishment on blue jeans and other clothing. A couple of decades later, I made this sand castle for the book, You and Me. The beach sand is made from raw silk that I dyed with a spray bottle. And yes, those are real beach stones glued to the fabric. Here’s George reading a fantasy story with my favorite castle design on the cover. I got out my old stack of Color Aid paper to make the book. 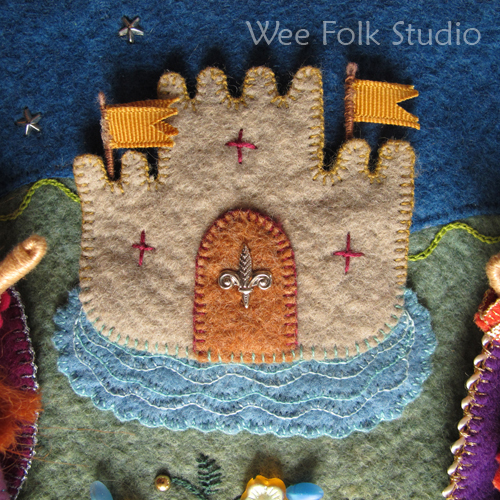 This castle is from a royal scene I made for a doll magazine in 2000. The fleur-de-lis on the castle door is a nail head. The project was in The Cloth Doll, Volume 14, number 2. The next 2 closeups are from my newest picture book, Pocketful of Posies. 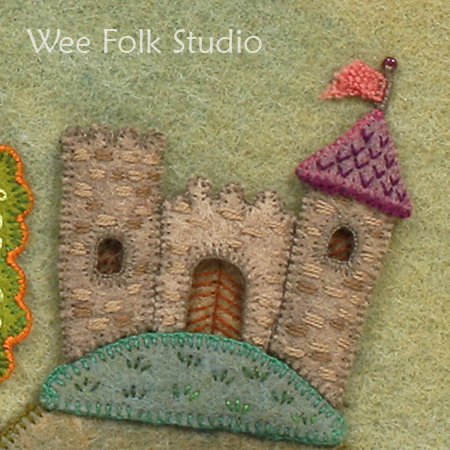 In this one from Old King Cole, I use a combination of clay beads and wool felt to make the stone wall. 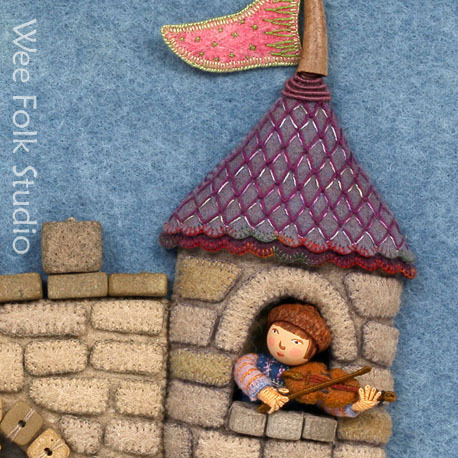 And the fiddle is made from felt. 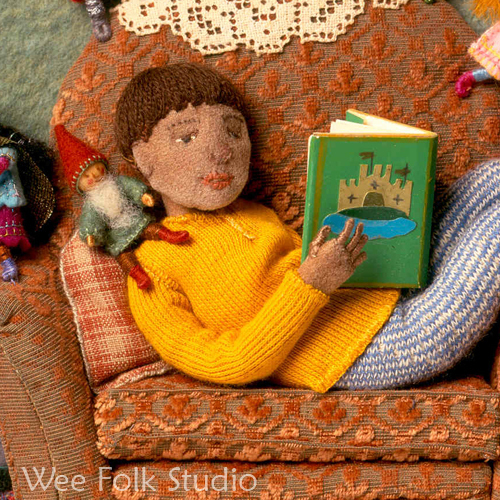 This entry was posted in Children's Books, Closeups, Fabric Relief, Felt, illustration by Salley Mavor. Bookmark the permalink. How lovely to see where your style evolved from all those years ago. My favourite is the sand castle, the detail is wonderful. The chain stitches in your 1974 album illustration give a cool Vincent van Gogh look to it. Your work is always a visual feast. I am new to your work, saw your link on the cottage smallholder site after she had reviewed your book. Your work is a visual treat. Indeed, your first “castle in the sky” from 1974 does evoke a feeling of Vincent Van Gogh’s “Starry Night”. Love seeing the evolution of your work since it continues to give me hope about what I attempt to do! I have such a LONG way to go! Thank you again for helping me to get where I want to be. George’s Chair is one of my favorite pieces of yours! Love the clay beads on the castle wall! What a nice texture that makes with the felt! Thanks for the eye candy, Salley.